Hello World! Its ur boy Samath once again, today i'm going to share with you one of my Specialty. A few years ago when I dip my feet into the .Net world i did it with Visual basic.Net. I went so deep into the language that I thought it was the best thing since slice bread. It was like meeting a girl today and marrying her tomorrow. until I met C# but that's another story for another day. While I was traveling the VB.Net Journey I created some very interested application. 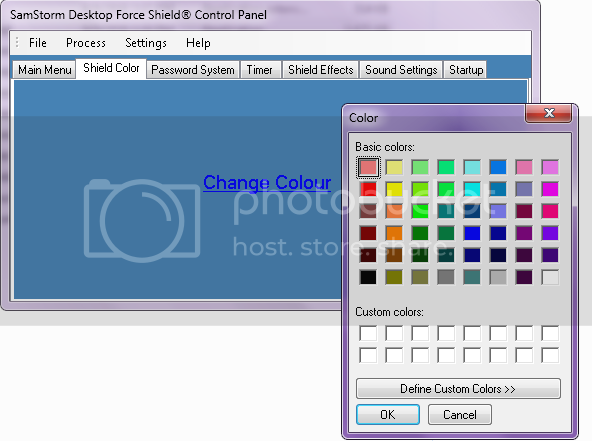 One of which is a Desktop Protection Program that I called SamStorm Desktop Force Shield, its a kool program that protects your computer from unauthorized access. I am going show you how the program work by providing code and screen shot. I am going to post the Source Code a comment below. Please Stay Tune to my Channel because I am going to post some very interested program in the future that will rock your world!!!!! 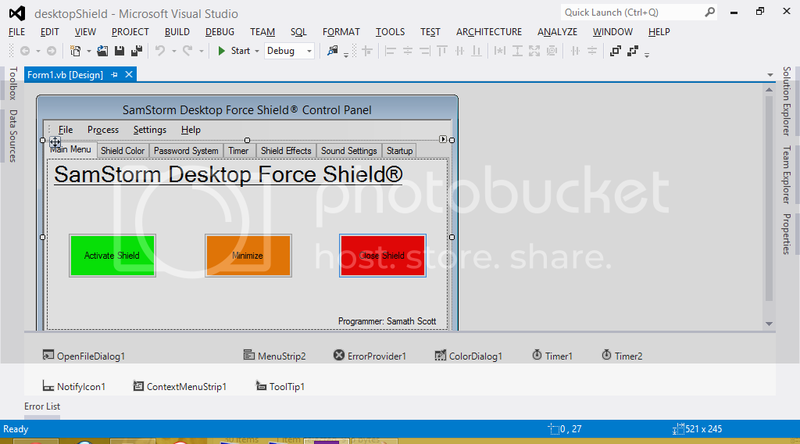 This is the project in Visual Studio 2012. If you don't have Visual Studio GET IT! When you open the program for the first time it will prompt you to create a password. This password is use to deactivate the program when its activated. The Default color of the program is blue. This is the main screen of the program. You can change the color of the program to what ever your heart's desire. Here is my Favorite part of the program. you can set the time you want the Shield to activate. Let me give a scenario; I lend my friend my computer once and I told him I was giving him 10mins to use it. I came here and set the time to 10mins, when its reaches the time the desktop locks. I can go on all day showing every feature of the program but this is the last feature i'm going to talk about. it you want to see more feature download the Program and test it...... When you press the activate button on the program this an example of the screen you will see. your screen will have a transparent look, for the purpose of this article I change my look to a solid. 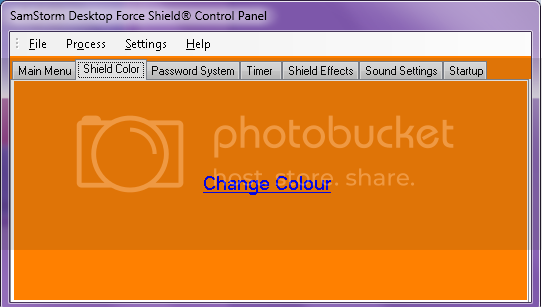 anyways when you see this screen press F11 on the keyboard, a dialog box will appear to enter your password to deactivate the shield. The code is longer and more complicatied than what I have post here, but for the purpose of this article I post a summary of the code. If you want the full code download the project, the link is in the comment section below. right. This flag can be used with roll or slide animation. left. This flag can be used with roll or slide animation. bottom. This flag can be used with roll or slide animation. top. This flag can be used with roll or slide animation. if AW_HIDE is used or expand outward if the AW_HIDE is not used. Public Const AW_HIDE = &H10000 'Hides the window. 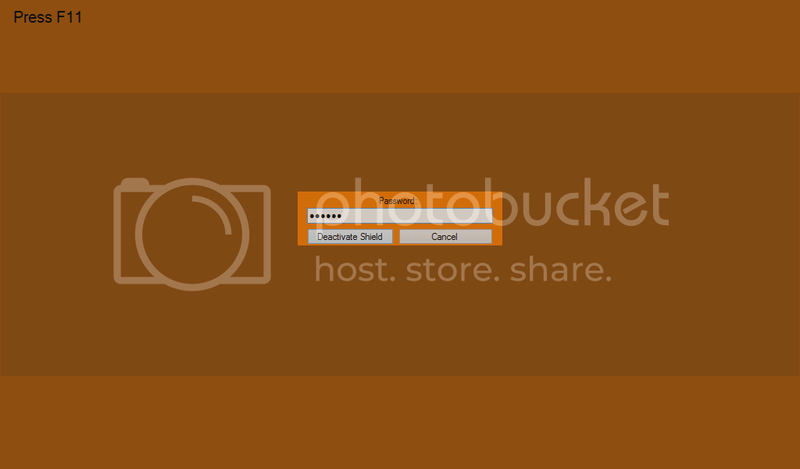 By default, the window is shown. Public Const AW_ACTIVATE = &H20000 'Activates the window. Public Const AW_SLIDE = &H40000 'Uses slide animation. By default, roll animation is used. used only if hwnd is a top-level window. 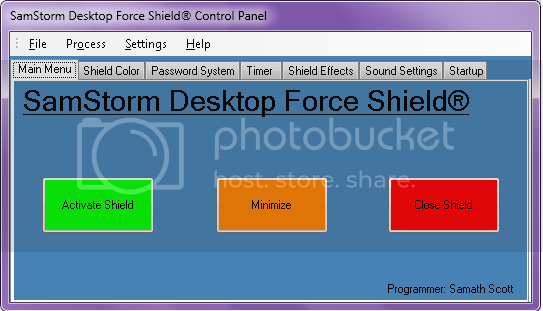 Dim start As String = "no start"
Me.NotifyIcon1.BalloonTipTitle = "SamStorm Desktop Force Shield®"
Me.NotifyIcon1.BalloonTipText = "Running In Windows Background"
I like the GUI of this program, it is simple and look easy to use.